OKLAHOMA CITY (AP) Russell Westbrook said in the buildup before playing ex-teammate Kevin Durant and the Golden State Warriors that it was just another game. The reigning MVP scored a season-high 34 points and added 10 rebounds and nine assists to help the Oklahoma City Thunder roll past the Warriors, 108-91 on Wednesday night. It was Oklahoma City’s first win over Golden State since Durant left the Thunder to join the Warriors after the 2015-16 season. Golden State won all four meetings last season by an average of nearly 20 points. Westbrook, who usually is animated anyway, was more talkative on the court than usual. At one point in the third quarter, Westbrook and Durant went forehead to forehead and were called for double technicals. 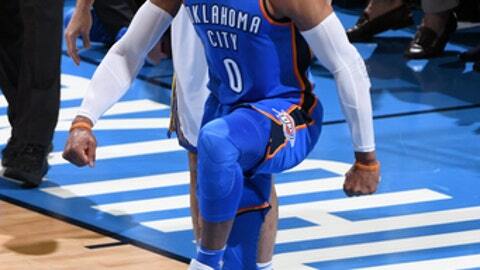 Westbrook downplayed the incident later. Oklahoma City’s fans are still sore over Durant’s departure. They booed him nearly every time he touched the ball. He finished with 21 points on 8-for-17 shooting. Stephen Curry scored 24 points for the Warriors, who produced their second-lowest point total of the season. Westbrook’s new All-Star teammates came through. Carmelo Anthony scored 22 points and Paul George added 20. It was a much-needed victory for the Thunder, who have struggled to an 8-9 start. The Thunder led 65-48 at halftime as Westbrook filled the stat sheet with 20 points, seven rebounds and six assists. Anthony had 16 points and George had 14 at the break. Oklahoma City held the Warriors to 42 percent shooting in the first half and forced them into 10 turnovers. The home crowd gave the Thunder a standing ovation as they walked off the floor. Early in the third quarter, Westbrook had a steal and dunk, then a steal and layup plus a foul that brought the crowd to its feet. He made the free throw to put the Thunder ahead 72-52. Oklahoma City led 94-71 at the end of the third and Warriors coach Steve Kerr pulled his starters with about eight minutes remaining. ”They got into a rhythm, the crowd got into the game, we turned the ball over and let them get off for easy layups,” Durant said. Warriors: Klay Thompson scored just nine points. He entered the game averaging 20.1. … Kerr was called for a technical with 5:59 left in the third quarter. Draymond Green got one with 5:06 left in the third. Thunder: Westbrook had 11 points, five rebounds and five assists in the first quarter. … C Steven Adams had 14 points and 12 rebounds. … Forced 22 turnovers. Oklahoma City continued a strange trend. All eight of its wins have been by nine or more points, and all nine of its losses have come by nine or fewer. The wins have been by an average of 17.8 points. The losses have been by an average of 5.7. Warriors: Host the Chicago Bulls on Friday. Thunder: Host the Detroit Pistons on Friday. For more NBA coverage: https://apnews.com/tag/NBAbasketball . This story has been corrected to show it was the Warriors’ second-lowest point total of the season, not lowest.